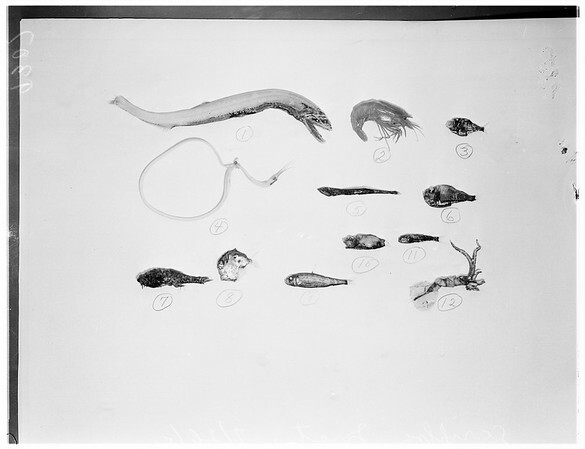 Caption slip continues: "#28: Specimens numbered, as shown. Specimens of odd fish brought back by Scripps exploratory expedition in North Pacific, on 2-month, 8200-mile trip: 1. 'Stomiatid' with row of 'photophores' under stomach, and dot in top cheek -- all of which 'light up' in sea depths. This one is 1 foot long. 2. Deep sea, brilliant red shrimp -- strange because such highly colored items rarely found in ocean's inky black depths. 3. Harchet fish. 4. Snipe eel, tangled in its own tail, a young specimen. 5. Deep sea specimen which has light making 'photophores' or spots on its body. 6. Hatchet fish, a variation with large bulging green eyes. 7. 'Melanphid' -- but what kind, scientists want to know? 8. Hatchet fish -- what peculiar evolution made it grow into this 'structural mess', the front end apparently uncertain which way to grow. 9. Until identified, this little fish is a 'what is it'? Taken off Mexico. 10. This member of the 'Barrel Eyes' has a flat, heavy 'keel' under him, but what for isn't known. It does make it possible to use him as a paperweight -- until he decays. 11. Lantern fish -- another specimen that brightens dark ocean corners with flashing 'lights' on his body. 12. Deep sea squid, pink and anemic looking from living in the dark".